A Police Station, South Africa by Sir Frank Brangwyn RA RWS PRBA HRSA, 1867-1956. 1891. Oil on panel. 17 1/8 x 17 inches (30.8 x 43.2 cm.) Initialed and dated: "F.B. 91," lower left, and inscribed in ink. "54 / a police station." There is a vestigial sketch of Zulus on the reverse side. Exhibited: London, The Japanese Gallery, March 1892 (1); London, The Fine Art Society (1978). In early 1891 Brangwyn, with his friend the painter William Hunt, was commissioned by the dealer T. J. Larkin to travel to South Africa to produce work for an exhibition at The Japanese Gallery at 28 New Bond Street. 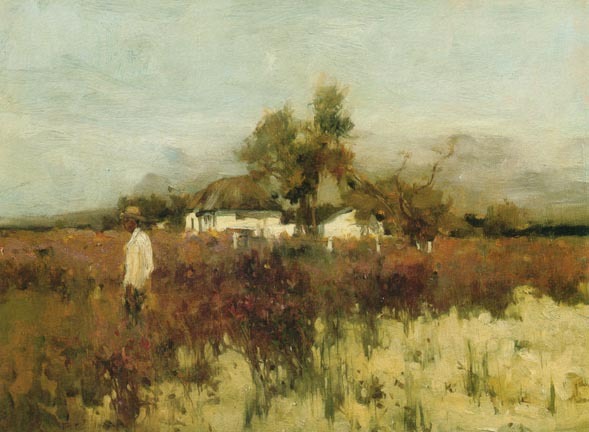 Larkin's intention was that the two painters should spend a year travelling in South Africa before returning but, as it turned out, and to Larkin's chagrin, their £1500 of expenses lasted but five months. The pair departed from newly built Tilbury Dock in March 1891 on the Union Castle Line mailship Dunnottar Castle, which occasion the present painting recalls. The greater part of the 55 paintings exhibited at The Japanese Gallery were painted on 12 1/4 X 16 1/4 inch fielded panels which Brangwyn carried in a specially constructed box in order to permit him to move on while the paint was still wet on the most recent pictures. The present picture was the largest by far to be shown in the exhibition although a small number of pictures of Cape Town on canvas exist that were painted on a larger scale than the standard panels. Eight years later Dunaottar Castle carried the young Winston Churchill representing the Morning Post and Sir Redvers Bullers and his Headquarters Staff to South Africa on the outbreak of the Boer War. Brangwyn first exhibited at The Fine Art Society in 1908, the first of eight lifetime exhibitions. The Fine Art Society Story. Part I. London: The Fine Art Society, 2001. Catalogue Number 6. Galloway, Vincent. The Oils and Murals of Sir Frank Brangwyn RA. F. Lewis 1962. P.46 (441).